Type a) The type piece from the legionary fortress, Gloucester-Kingsholm, is dated to the first century AD. The photo in Peacock & Williams, 1986: Class 66, which is missing its rim, does not look like Type b, usually stated to be that form. The body is cylindrical, like a Gazan amphora. A rim to base fragment of a cylindrical amphora found in a mid first century AD context in Beirut (BEY 006.12300 cistern deposit) may be equivalent to Peacock & Williams Class 66. It has a distinctive collar rim with a pronounced concave lid seat. If so, the form is in a hard-fired orange-red fabric very close to that of Beirut amphorae of the same period. A Beirut attribution needs to be confirmed through chemical analysis. It is unclear if the form had a rounded base, or a hollow rounded cone toe as Type b. Type b) A complete amphora classified as ‘Kingsholm 117’ was found at Lyon (Desbat & Picon, 1986: Fig. 2.10). The shape is in the Phoenician-Palestinian tradition of ‘hole-mouthed jars’ (cf Gazan amphorae), with ring handles attached to the shoulder and a short collar rim. The body shows well-cut band ribbing. The base has a short hollow rounded cone toe. The direct predecessors of the type (and its base) are Hellenistic north Palestinian (e.g. the stamped Tell Dor amphorae). 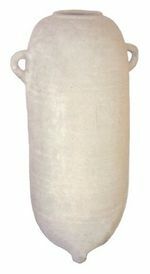 The fabric of a Beirut example is similar to that of some ‘carrot’ amphorae/Peacock & Williams Class 12 (but not the ‘carrot’ amphorae made in Beirut) and would also suggest a Palestinian origin. Type a: mid first to first half of the second century AD (Beirut examples), earliest date: early first century AD (Beirut; Lyon (Desbat & Picon, 1986), latest date: early third century at Lyon (Lemaître, 2000). Type a: Beirut, mid first century AD to the first half of the second century AD; Gloucester-Kingsholm, (Type 117, first century AD). Type b: Rarely exported, but one of the few Palestinian amphorae to be exported during the early Empire (see the ‘carrot’ amphora Peacock & Williams, 1986, Class 12, for a more common export to the west) Lyon (Desbat & Picon, 1986: Fig. 2.10, early first century AD; Lemaître, 2000, early third century); Rome (Rizzo, 2003: 154-5: Neronian; 171, Flavian; 183, Antonine); Beirut (early first century AD; first half of the second century AD bases).